Christina Y. Weng, MD, MBA, Assistant Professor-Vitreoretinal Diseases & Surgery and Fellowship Program Director at Baylor College of Medicine-Cullen Eye Institute, shares her video highlighting Drainage of a Suprachoroidal Hemorrhage. Dr. Weng provides her surgical video summary below and includes her video (click on the arrow) and she also tells RetinaLink why she decided on retina, her mentors and what is most challenging professionally in RetinaLink’s ongoing #ilooklikearetinasurgeon series. 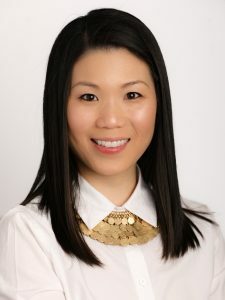 C. WENG, MD, MBA (CYW): I decided to become a retina specialist because I loved and welcomed the unique challenge that each retinal disease presents. The fact that no two surgeries are alike keeps things interesting and provides an opportunity to continue growing as a physician on a daily basis. Additionally, there are so many developments on the horizon of our field, it is really an exciting time. CYW: I am incredibly grateful to have so many amazing mentors—both male and female—who have guided me in different ways through my early career thus far and there are too many to list them all in this limited space. I am particularly grateful to a number of women mentors who have been especially influential in shaping my growth and aspirations: Dr. Nina Berrocal (Bascom Palmer Eye Institute), Dr. Susan Bressler (Johns Hopkins Wilmer Eye Institute), Dr. Diana Do (Stanford Byers Eye Institute), Dr. Nell Gregori (Bascom Palmer Eye Institute), Dr. Judy Kim (Medical College of Wisconsin), and Dr. Jennifer Lim (University of Illinois Chicago). These accomplished and inspiring women are important role models for me and many, many others! RL: What is your greatest challenge professionally? CYW: The biggest professional challenge for me is maintaining balance between clinical duties, research, teaching, and life outside of work. I’m lucky to have a many extraordinary female mentors who seem to always have words of wisdom to offer when I am faced with making difficult choices.